I'm what you would describe as the "indoorsy type." Not only is my skin capable of burning within five minutes on sunny days, but I am also a complete and utter wuss about any and all inclement weather, and my teeth tend to chatter when the temperature dips below 60 degrees F.
Suffice it to say, I prefer to spend the long winter months holed up inside, particularly now that I have moved to the wintry tundra that is Wisconsin. Thankfully, staying indoors over the winter doesn't have to be a drag. 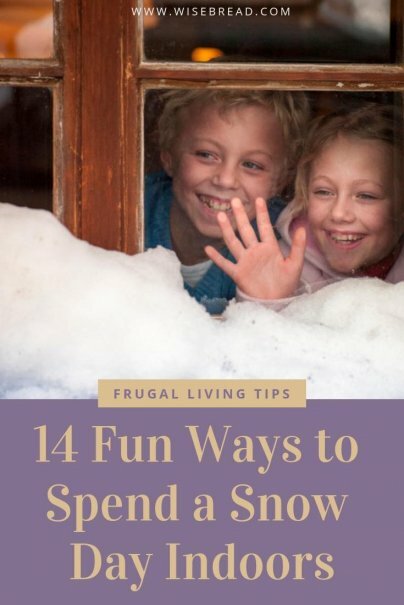 In fact, all the frugal and fun indoor activities can make winter the best season of all. Here are 14 fun indoor activities you can enjoy while the wind is howling and the snow is falling outside. Watch every film in a franchise. Maybe you've always wanted to see all of Freddie's Nightmare on Elm Street adventures or watch every single movie in the The Fast and The Furious franchise. Watch several films by a specific director. Check out early, midcareer, and recent films by a director you love to see how their talents have grown and changed over the years. Watch a remake back-to-back with the original. Watch films from a best-of list. Watch several of the most popular films from the year you were born. A luxurious bath is a staple of indoor winter relaxation, but you can do much more than just stretch out in a hot tub with a book. Why not treat yourself to a mani/pedi, deep condition your hair, exfoliate your skin, and give yourself a facial while you're at it? These are all spa treatments you can easily give yourself at home without breaking the bank. You'll feel refreshed, and you'll be helping to protect your skin and hair from winter dryness. You can probably remember spending hours at a time drawing when you were a child, but it's likely you haven't done so in a while. Pull out some pencils and paper, and you'll soon remember just how fun drawing is. Whether you simply find pictures online that you'd like to copy (which is how art students learn, after all), or you take the time to learn the fundamentals of drawing, your reintroduction to being an artist can be a thrilling way to spend your indoor hours during winter. The key is to let go of any perfectionist tendencies and draw the things that feel the most fun to you, whether that's unicorns, chain saws, or chainsaw-wielding unicorns. Nothing is more homey than the smell of fresh-baked cookies. Even if you have never made anything more complex than slice-and-bake cookies, following the recipe on the back of the bag of chocolate chips or oatmeal canister is an easy way to get started as a from-scratch baker. If you're willing to try other types of baking, the time you spend indoors on a long winter day is perfect for allowing bread dough or pizza dough to rise. There is something very satisfying about spending the day working on something you can eat and share with others. Whether you have physical photos stored in old shoe boxes, or a computer full of photo files, a winter day spent indoors is the perfect time to organize your pictures into albums. It will be fun to walk down memory lane looking at your old photos, and you'll end the day with an enviable sense of accomplishment. You may be cooped up inside, but that doesn't mean you can't get some exercise in. Move your couch out of the way, turn on your favorite station on Spotify, and get down in your own private dance club. This is also the perfect time to learn how to do all of your favorite dance moves. Find some tutorials on YouTube and hone your moves at home. Finally, you probably still have that old Dance Dance Revolution video game and mat stashed somewhere. Dust them off and make your dance party an actual game challenge. Whether you're rocking the snow day solo or with the whole family, you can have a lot of old-fashioned fun by dusting off a puzzle or board game. One of my most cherished memories from my first house with my husband was the day I spent rereading Harry Potter and the Deathly Hallows in the living room while snow fell just outside the windows beside me. There is something so cozy about curling up with a book on a cold day, especially if you are lucky enough to have a roaring fireplace next to you (not to mention a cup of hot chocolate). Receiving an actual letter in the mail is such a rare occurrence these days that we rarely think to sit down and write one ourselves. Taking the time to think of someone special you could write to and putting your thoughts into a handwritten note will make you (and them) feel great. Aim for a nap during your natural energy slump in the afternoon. This is usually between 1 p.m. and 3 p.m.
Thirty- to 60 minutes is the length of naps most likely to make you groggy after you wake up. Try to sleep either longer or shorter than 30-60 minutes. If you don't have more than an hour, plan on a quick 10-20-minute snooze, which will leave you feeling awake and alert afterward. If you've got plenty of time to nap, a 90-minute siesta lets you go through a full sleep cycle, which will allow you to wake up easily and feel refreshed. Extroverts who might otherwise be climbing the walls on days they are stuck indoors now have many different ways to stay in touch with their nearest and dearest, no matter how frightful the weather might be. Phone calls, Skype, and FaceTime all give you the opportunity to connect, as do Facebook and Twitter. A day of nowhere-to-be is a great time to reach out to those you may have been thinking about but haven't had the time to connect with. Not only does swapping your couch with that chair and moving your TV into a different corner help your home feel new and improved, it also gives you a chance to clean some neglected spots. It's likely that you'll unearth some stale Cheetos and pet hair tumbleweeds from beneath the couch, which you can easily sweep up when the couch is pulled away. While cleaning is no one's idea of fun, rearranging furniture can bring new life to a tired room — and you can't help but clean while you go. It's immensely satisfying to throw yourself down on your newly moved chair and enjoy the new layout in your much cleaner living room. Putting together mix tapes is getting to be a lost art, but you can recreate the fun by creating playlists of tunes you love on your favorite digital music provider. Being stuck at home doesn't mean you have to miss out on happy hour or your favorite elaborate coffee drink. Use your indoor time to learn how to mix your favorite cocktails or brew your favorite coffee treats. You can find recipes and video tutorials online.